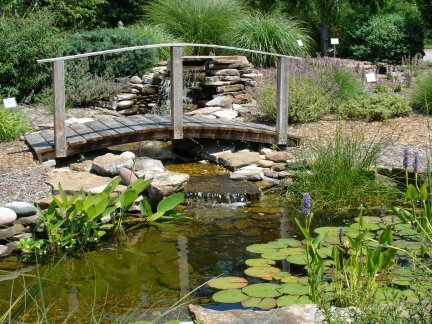 Water gardens and ponds add beauty, tranquil sounds and a refuge for wildlife in your garden. As winter approaches, it is important to prepare the pond for the cold temperatures ahead. With a deep enough pond and the right preparations, your fish should be able to survive in the pond through winter. The most important task in the fall is keeping the pond clean of debris and dead or dying plant material. Nets placed over the pond can collect leaves and other flying or falling debris and make disposing of them easier than if they get into the pond. Some debris will collect in the pond and must be cleaned out as much as possible. Keep in mind that the later it gets, the colder the water will get! As water plant material dies, cut it back so it will not reach the water. Stop all fertilization of plants and remove tropical plants before the first frost. Hardy water lilies may remain in the pond for the winter. Prune away the foliage as it dies in the fall. If you would like to over-winter a potted hardy water lily inside, wrap it in a plastic bag to prevent it from drying out, store the covered potted plant in a cool non-freezing location. Any bog plants that were growing on the perimeter of the pond should be pruned within 3” of the pot and sunk to the bottom of the pond. The pump and waterfall can be kept running until the water begins to freeze. Some pond owners keep the pump going all winter. If the pump is turned off, it must be removed and kept from freezing. It should be stored it in a container of water to keep all parts moist and prevent it from seizing up when started in the spring. Any tubing that is not used over the winter should be blown out to prevent freezing. Remove decorative fountain heads, clean them and store them in a dry, warm area. Rinse the bio filter media. A hole must remain in any ice that forms on the pond to allow gases to escape from decomposing materials and allow a small amount of oxygen into the pond. This exchange of gases will help your fish survive the winter. Your fish must also be protected from freezing. They will find small crevices between the pots placed for winter at the deepest level of the pond. Placing a pond deicer over the most sensitive plants (usually at the deepest level) will keep an opening in the ice and help to protect water plants and your fish from freezing solid. If the pond becomes completely covered with a layer of ice, do not break the ice as the concussion may damage or kill the fish. Instead, pour warm water over the pond until an area opens. Keep feeding your fish to fatten them up for winter until the water temperature reaches 50°. Stop feeding once the water temperature stays at 50° or below. As the water temperatures get colder, metabolism of the fish slows and food will not pass through them. If they eat food during this time, it can swell inside the fish and cause death or bursting. As metabolism slows, fish go into a dormancy and use little oxygen and survive on stored food in the body.